It seems that this happens all the time here. I don't know what causes this but it happens all the time here. No matter what direction it seems either. In this event I have had 80mm/hr+ from the NE, NW, SW and SE. Crazy. Anyway the sun is out. 13.8mm for the day making it another ~80mm event here!! ~175mm for the week. I think your right Karl Northern and Western suburbs may get there share tonight as winds tend more Southerly then SSE over the next 6-10 hours the shift and focus of the bay stream will move further west during the night as winds go more SE by dawn tomorrow. Karl, I know it's been brought up before, but I'm just curious as to why you record so much more rain where you are (Knoxfield) than the Scoresby AWS (not sure where it is exactly I think you may have mentioned once that it's not actually in Scoresby), but also more than what people report in Lysterfield and Boronia and other nearby areas. You seem to be recording a lot more rain than these areas all the time, and from all directions with all different types of systems. I've looked at the topography of the area and it's pretty flat until you get out to Lysterfield so I can't see any local topographic influences there. Also quite often you seem to get close to or more than David out at Ferny Creek which is one of the wettest places in central VIC. Please don't take this as a challenge or anything because it's not , I'm purely just curious as to what factors may cause you to have such a spike in rainfall compared to surrounding suburbs. I must live in Tropical VIC. The palms, ferns, everything is looking so so so green. Water is everywhere, birds are swimming out there in the puddles. Amazing!! Now we just have to keep it going. I think that is it or here, but you can never be sure!! Well that is quite true of recent Andrew, I have been getting more than DJ these past few months in particular. I think it is maybe due to the bay being warmer. Last week we had a shower come in from the SW which dumped 7mm here, 4mm @ Scoresby AWS and less as you went towards the hills. To my west, south, east are hills, Wheelers Hill to my west is about 150m tall and it pretty much drops fast on the eastern side into the valley near Jells Park. I live about 4km from that point. I think it is due to the fact I am in a bowl here in terms of being ringed by mountains. That last line of showers that came through here, just slammed down, came off the hills to the south, Rowville is a little higher up and they rise off that and then drop as they go across lower terrain. This is a common feature and can be thing that either makes DJ wetter, or me wetter in these situations. We have had a lot of SSW flows this year. Last year I got diddly squat. I must say the area around Cardinia has been much wetter than here, Berwick would be 100mm up on me for the year and around Monbulk as well, really copped it more than here if you can beleive that. I understand what your saying, because I find it hard to believe, it is absurd!! It has happened since I have been really recording weather. People on WZ think I fudge the numbers, I wish I were that pathetic haha! I don't get it. Maybe DJ might have some more insight on it. Oh and BTW - the sun is out and the rain has stopped!!! Karl Lijnders wrote: Well that is quite true of recent Andrew, I have been getting more than DJ these past few months in particular. I think it is maybe due to the bay being warmer. Last week we had a shower come in from the SW which dumped 7mm here, 4mm @ Scoresby AWS and less as you went towards the hills. Thanks for that information Karl. I can imagine there are some enhanced localised effects there due to topography, particularly with the bay and Dandenongs being so close to each other and a predominant westerly flow here in southern VIC. We get the same thing here at times, usually with SE flow or convective rainfall where we can get a fair bit more here than the Mt Macedon MW station. Most other times though, obviously it is wetter further up the mountain. Anyway I should get back on topic, lol. Need some weather here to allow that to happen, it has been a bit of a boring day today. Sun poking out now. Having lived next door to Karl in 2001/2002...i can vouch for the Knoxfield rainfall, rains more in that suburb than any other in Melbourne. At times like today i would have 15mm of drizzly misty showers, and then ring home to the folks in Coldstream who hadnt had a drop. And Coldstream is usually a very good rain totaller. Just something to do with geography i geuss. The sky today reminds me of a day in Surfers in 2000...looking SE over the water from Surfers it had exactly the same look. Very white mid level deck with embedded towers everywhere poking there heads up and actually intertwined into the mid level deck. Will never forget the look, or the storm that we copped half an hour later from the SE...today looks exactly the same looking toward the South. Preposterous as it sounds.. I just drove up to Wheelers Hill shopping center and the darkest clouds I've seen all day would have been over Karl's area. When systems do pass by, if I look ENE from my place that is usually where most of the action is. That is just past the Wheelers Hill area. Had one thumping showers at Sandy which had a bit of hail in it - but was in the water so just made the ocean deeper! Thanks SC!! It has been a fun day. That convergence band is sitting moreso over the ranges to the east now but looking south, with these SSW winds, the convergence band may be developing a secondary shower feature further west in the coming hour. So may be a bit more to come. Well here in Lysterfield we've had 2mm, that's it lol! I was driving towards Stud Park shops (just off Stud Road) when the last big downpour came through and I can vouch for it being extremely heavy rain - gutters overflowing, storm water drains could not cope and were spewing huge amounts of water over the road, visibility was very poor. Yet I get home and nothing! My Mother in Law lives in Knoxfield, not far from Karl and she regularly seems to get more rain there than us. I have been to her home and had it absolutely pelt down, yet I come home and I've recorded practically nothing. It doesn't help that the Scoresby AWS isn't in Scoresby at all so comparing Scoresby AWS to Karl can be misleading unless you know where it's located. I am in FT Gully a fair bit and they get a lot more rain than Lilydale does, or at least over the past 12 months anyway, and FT Gully is next door to Knoxfield. Was getting the odd rumble here but I think it's now died. Just 6.5mm in the last 24 hours, still less than half our November average. Here comes Melbournes 100mm rainfall opportunity for November. Looking like 5mm in this band alone!! Nice small bands have continuously been coming up from the bay towards my area. Have had good falls here all day. Crazily frustrating day today. Heavy showers have missed to the east for most of the day by as little as 1km or less and now an area of heavy showers inches closer and closer to us from the west only to miss by about 5km to the west. Could have easily ended up with about 5-10mm today but as it is I only got 0.6mm. Highly likely that could be it now for here. Not convinced that the SE flow will have an impact tonight, normally it would but MLAPS (picks up small scale rainfall) isn't interested. Anyway, for this entire event ended up with 37.3mm, 106.5mm for the month, average is 77.3mm. Fantastic after that ridiculous heatwave to get this massive change back to normal patterns, rainfall since June is very close to normal which puts into perspective just how dry it was from January to June. apart from showers this morning (which sounded heavy) the rest of the day has been dry and mostly sunny, with clouds interupting the spells of sunshine. so if i was to write something about today's weather, it would be early showers cleared to a fine and mostly sunny but windy afternoon. Sound like anyone else? Plenty of Cj developing here in sheets. 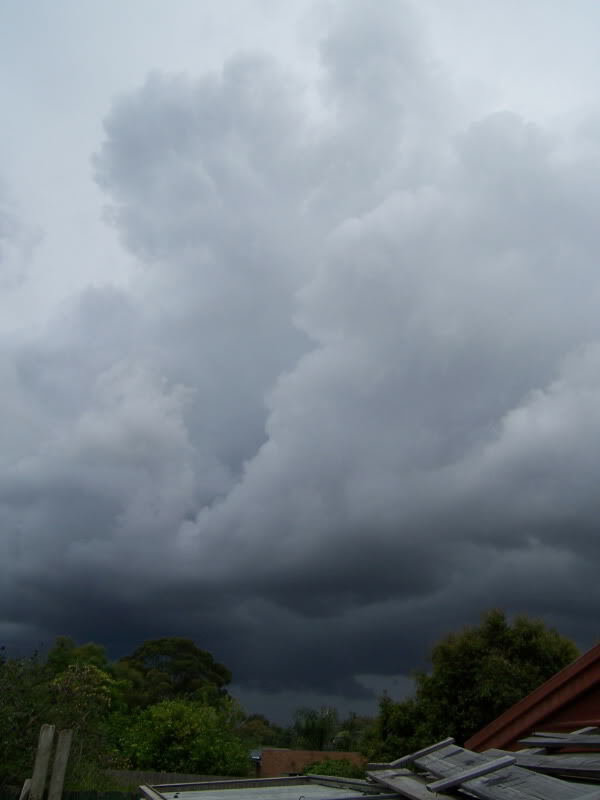 This was the incredible shower that dropped nearly 8mm in as many minutes here this afternoon at about 2:30pm. Looking south in the development stage. A few showers here past hour, expecting a couple more overnight. Now to study for an exam tomorrow!!! Showers appear to be coming in from the SE now over the bay. Hopefully a stream can get going in the next few hours. Isolated storms around to our S this arvo boosted our overnight tally from 19 to 21.5mm. Clouds have been comming from the SSW virtually all day, hoping it tends more southerly overnight. Had a couple of heavy showers over past 20 mins and still raining lightly out there now.